Described by it’s creators as a re-imagination of the 1979 Atari classic Lunar Lander arcade within a “fictionalized Lunar Module simulation”, Lunar Flight takes players to the surface of the moon as the pilot of a multipurpose spacecraft. Developer Shovsoft is an independent team started by Sean “sh0v0r” Edwards, supported by a small group of contributors. The game is available for purchase via digital download from Steam, Desura, and Gamersgate.Lunar Flight is priced at a very reasonable $7.99 on Steam. Lunar Flight is a unique title bringing together elements of arcade and simulation… and it works. Writing this article for the readers of SimHQ, I want to take a moment up front and discuss this title from the perspective of a simulation enthusiast. 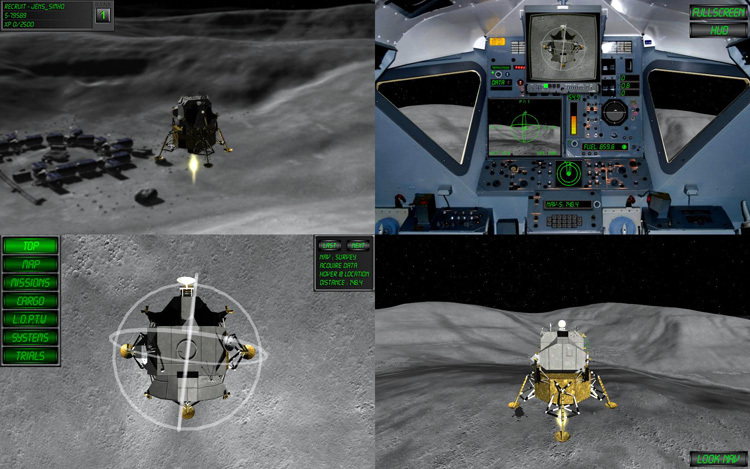 Lunar Flight is not a simulation of Grumman’s Apollo Lunar Module. It’s not a simulation of the Apollo missions that landed on the moon. What Lunar Flight claims to offer as a simulation is “Authentic Newtonian Space Physics”, and while a more strict simulation enthusiast might initially look at that within the rest of the “arcade” type package and turn away, let me encourage anyone in that category to reconsider, at least to read on. The lander on approach to the pad. The physics of Lunar Flight are what I’ll cover first, because I think this is where the real heart of the game lies. Everything else that happens in Lunar Flight exists solely to challenge players within the physics model. For those readers wondering about the accuracy of the Lunar Newtonian physics modeling, I can’t give a meaningful assessment. I’m not a real world pilot, certainly not an astronaut. That said, the experience of flying in Lunar Flight comes across much as I would imagine it should. Controlling the space craft is done with a combination of the main engine (represented by the descent engine of the real world Lunar Module Descent stage) and the reaction control system (RCS – represented by the four Reaction Control Thruster assemblies on the real Lunar Module Ascent stage). Both the main engine and RCS are variable thrust when controlled with an axis input. 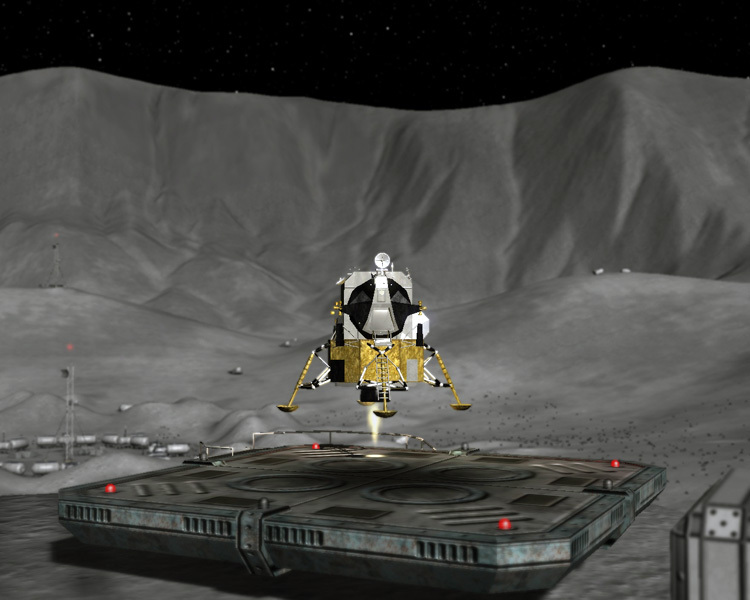 Unlike the real world Lunar Module which separated at the ascent and descent stages, the fictional Lunar Module in Lunar Flight does not separate. Instead, the main engine and RCS fuel tanks are refilled at landing pads and the entire assembly is flown as a single unit. From the landing pad you increase the thrust on the main engine until the thrust is suitable to overcome the gravitation of the moon. Hovering requires a continuous thrust, the amount required depending on the total weight of your lander (which varies due to cargo loads). From this point commanding the RCS for pitch, roll, yaw, and lateral translations gets you around. A relatively simple (and safe) method is sticking to lateral translations, where your space craft will “slide” over the lunar surface in an upright attitude. I say “relatively” simple (and safe) because you’ve got to keep a handle on things. For example, if you leave the pad and enter a hover then command RCS into a forward lateral motion, this motion can be countered by an opposite RCS command directly along the same axis which you are moving. But if you should yaw while in flight, rotating your RCS thrusters off your initial axis of movement, countering your movement with the opposite RCS which started your motion will result in your space craft being deflected to the left or right of your initial heading. If perchance you’ve rotated a full 180 degrees, then that opposite RCS thrust would actually accelerate your space craft. With some experience you can use these realities to your advantage, such as when you want to turn along a curving forward path by commanding RCS in both lateral and yaw axis simultaneously. Pitching hard to vector the main thruster. A more dangerous way to fly is by pitching your hovering space craft into the desired flight path and increasing your main engine thrust, thus vectoring a portion of that thrust into lateral translation. Given that the main engine is considerably stronger than the RCS thrusters, this approach can get you moving fast. But you’ve got to face the fact that you left the pad all nice and “level” so that your main thruster was directly in line with your vertical axis, but after having pitched the space craft over, finding that attitude again is not at first easy. This same thing occurs after having landed directly on the lunar surface, which of course is undulating and debris strewn. Repeatedly I would try to reestablish a clean vertical attitude, but was just a bit off. This meant that my main engine and RCS thrusters would all amplify the tilt relative to their own axis. Couple this with the fact that the longer a thrust is commanded the faster the the movement on that axis becomes. Needless to say, this can have a pilots hands full very quickly. I’ve written a lot of words describing the physics of Lunar Flight. I do this because I think they are a great challenge and incredible fun. My early experiences had me sweating just trying to get back on the landing pad, never mind complete a mission objective. And a few mishaps such as inadvertently making contact with the lunar surface or structures, which resulted in my space craft beginning to tumble, were some of the most intense moments I’ve experienced in a simulation. I was staggered at how quickly even a slow tumble from snagging my landing gear on the edge of a lunar base structure could mushroom into a nightmare. And how that nightmare could unfold at what seemed such a very *slow* pace. As I said, it’s fun. 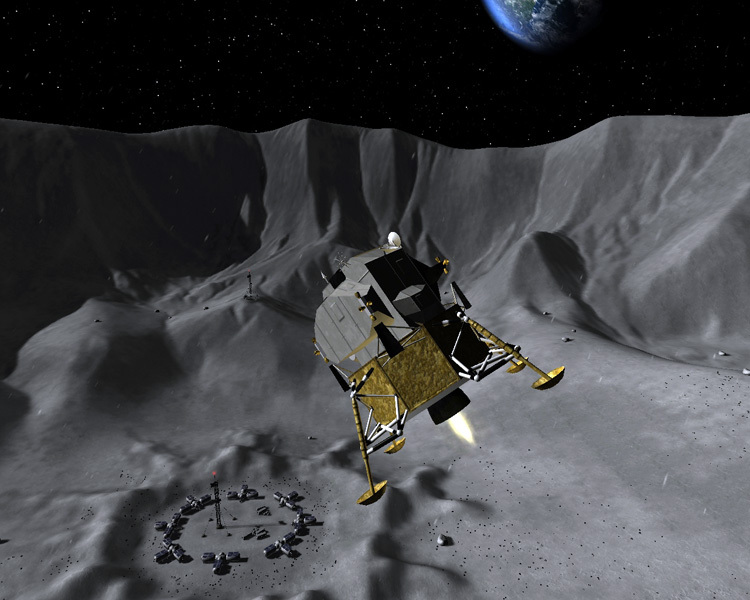 Those who like to test their simulator flying skills will likely find an enjoyable challenge in Lunar Flight. As already mentioned, Lunar Flight has it’s roots in the classic Lunar Lander arcade machine. 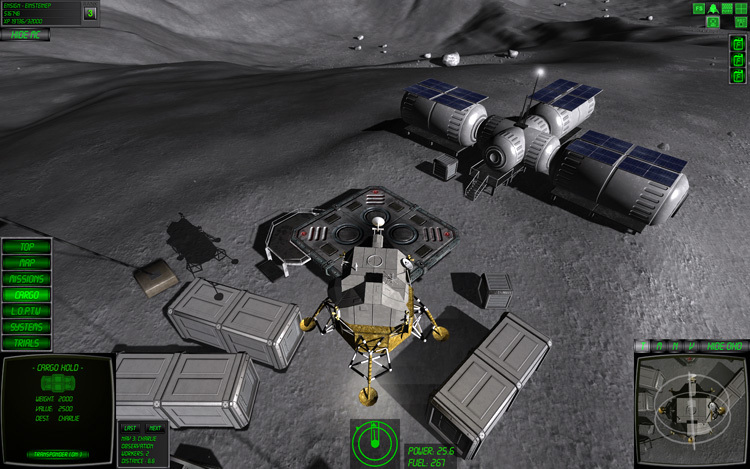 From the arcade world Lunar Flight draws many common gameplay elements together, such as achievements, experience points, in game cash, upgrades, and special items. These provide the motivation for completing missions and advancing to harder maps. Let’s look at some gameplay elements in greater detail.